The southern slopes of Mt. 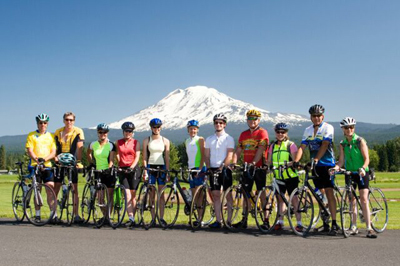 Adams in June are a bicyclist’s paradise with good roads, exceptional weather, cool temps, easy to challenging rides and unequalled vistas against the glorious snow clad backdrop of magnificent Mt Adams. awesome views with your fellow riders in the fresh mountain air. mile Family Fun Ride (Trout Lake Valley) , the 51 Mile Loop through Trout Lake, BZ Corner, Glenwood, and back, the 54 Mile Forest Loop (up and down the flanks of Mt Adams) and the combined 105 Mile Infinity Ride (55 + 54 mile loops). Each well-marked ride takes you on quiet country roads through some of the most beautiful countryside around. participate, and added more options for meals and T-shirts. Additional – Ride T-Shirts: $10 each. Post Ride Meals: adult $15, child 10 and under $10. Registration, more information and route maps – Online at www.TroutLakeWashington.com.